Home > Special Offers > Sales > Get the 2019 Mazda CX-9! Get the 2019 Mazda CX-9! 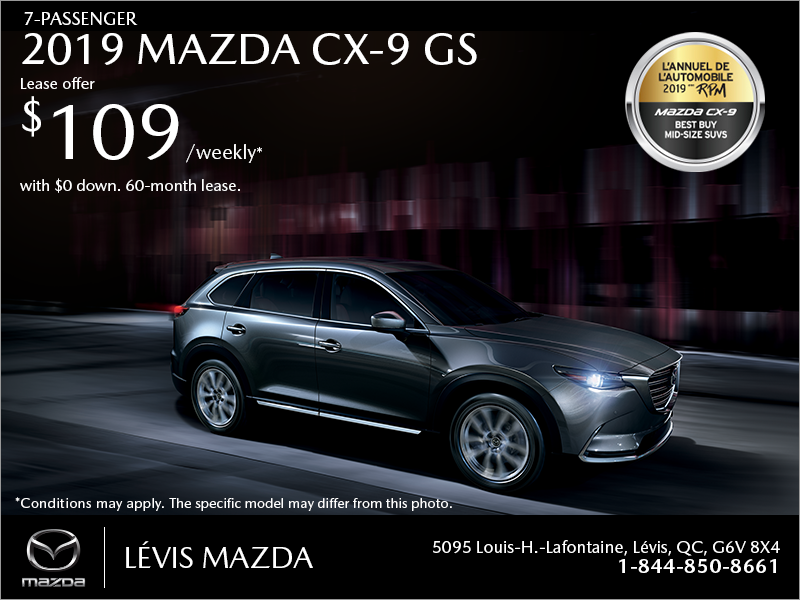 Lease the 2019 Mazda CX-9 GS starting from $109 weekly for 60 months with no cash down. ▼Shift Into Spring Credit offer (value up to $1,000) is available to qualifying retail customers who cash purchase/finance/lease a select new, in-stock 2018 and 2019 Mazda model from an authorized Mazda dealer in Quebec between April 2 – 30, 2019. Amounts vary by model: $300 on all 2018 Mazda3/Mazda3 Sport, on all 2019 CX-3 and on all 2018 & 2019 CX-5 models. $475 on 2019 MX-5 ST GS models. Maximum $1,000 on all 2018 MX-5 ST/MX-5 RF, on 2019 MX-5 ST GS-P & GT, on all 2019 MX-5 RF, on all 2018 Mazda6, on all 2018 & 2019 CX-9 models. Shift Into Spring Credit applied before taxes. Some conditions apply. NOTE: Shift Into Spring Credit offer not available on 2019 Mazda3 and 2019 Mazda6 models. See dealer for complete details.